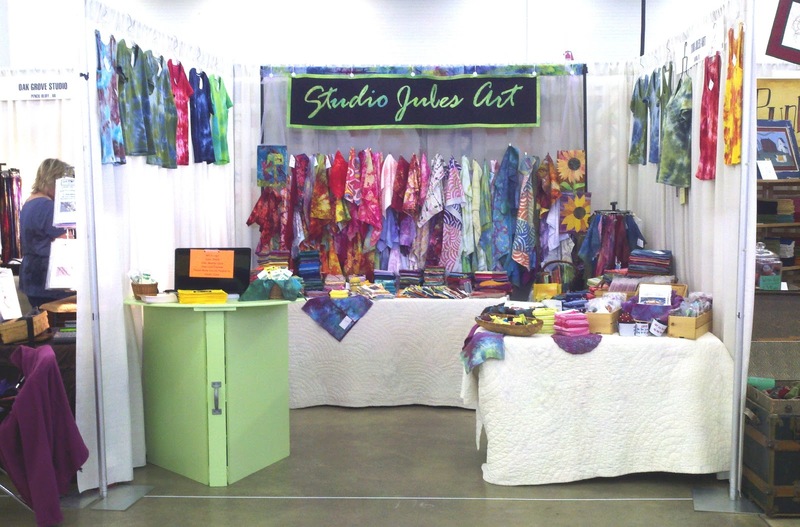 Studio Jules Art - Blog: Dallas Quilt Celebration 2012 is Underway! Dallas Quilt Celebration 2012 is Underway! The Dallas Quilt Celebration 2012 started yesterday and opening day was fantastic! The quilts are awesome, as always, and the vendor area is rockin'! The Dallas Area Fiber Artists are in the Special Exhibit area with our community service project "Pathways" benefiting the Alzheimer’s Art Quilt Initiative. My booth was busy yesterday, quilters and fiber artists are loving the ice dyed fabrics and the hand dyed perle cotton. They are snatching up the hand dyed thread trash like you wouldn't believe! Here is a picture of my booth (number 196) if you are coming out today or tomorrow, come by and say hello! I am thrilled to meet so many creative people and share my excitement about my fabrics! Your booth looks beautiful. Congratulations!